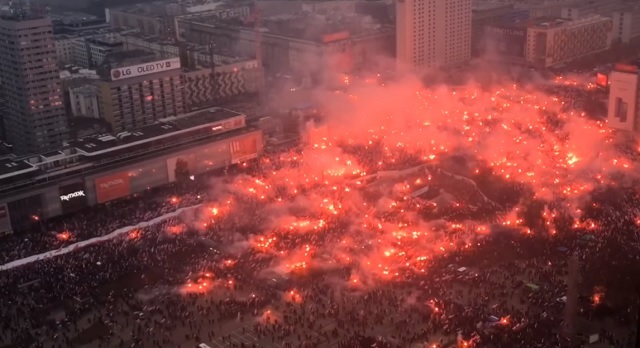 Over 200,000 patriots marched in Warsaw on Sunday to celebrate Poland's independence, despite the outgoing feminist mayor trying to ban the event earlier this month to stop "aggressive nationalism." Huge crowds have been celebrating the centenary of Poland's independence, amid controversy over a decision to include far-right groups. Nationalists were among more than 200,000 people taking part in a march in the capital, Warsaw, which was led by President Andrzej Duda. Opposition parties boycotted the event. It comes as French President Emmanuel Macron urged world leaders marking the centenary of the World War One Armistice to reject nationalism. Poland's National Independence Day commemorates the restoration of the country's sovereignty from the Russian, German and Austro-Hungarian empires in 1918. Most participants in Sunday's march in Warsaw were seen carrying Polish flags and wearing red-and-white armbands, but some were holding banners representing far-right parties from Poland and Italy. Many of those attending the march brought red flares that filled the streets with smoke. President Duda had said he wanted the march to be a proud and joyful celebration and warned that anyone carrying offensive banners or chanting the types of slogans heard at last year's event - such as "Pure Poland, white Poland" - would be dealt with by the police.